Thomas Friedman makes some excellent points in his recent New York Times Op-Ed article. China must be very happy about our government's gridlock. "... Most of the Republicans just elected to Congress do not believe what their scientists tell them about man-made climate change. America’s politicians are mostly lawyers — not engineers or scientists like ours — so they’ll just say crazy things about science and nobody calls them on it. It’s good. It means they will not support any bill to spur clean energy innovation, which is central to our next five-year plan. And this ensures that our efforts to dominate the wind, solar, nuclear and electric car industries will not be challenged by America. Finally, record numbers of U.S. high school students are now studying Chinese, which should guarantee us (i.e. China) a steady supply of cheap labor that speaks our language here, as we use our $2.3 trillion in reserves to quietly buy up U.S. factories. In sum, things are going well for China in America." A thought provoking piece by David Brooks on the difference between observing and acting, through the lens of Tolstoy's life. "... There are many reasons to think about Tolstoy on the centennial of his death. Among them: his ability to see. Tolstoy had an almost superhuman ability to perceive reality. As a young man, he was both sensually and spiritually acute. He drank, gambled and went off in search of sensations and adventures. But he also experienced piercing religious crises. But when he sat down to write his great novels, his dreams of saving mankind were bleached out by the vividness of the reality he saw around him. Readers often comment that the worlds created in those books are more vivid than the real world around them. With Olympian detachment and piercing directness, Tolstoy could describe a particular tablecloth, a particular moment in a particular battle, and the particular feeling in a girl’s heart before a ball. He had his biases. In any Tolstoy story, the simple, rural characters are likely to be good and the urbane ones bad. But his ability to enter into and recreate the experiences of each of his characters overwhelms his generalizations. Isaiah Berlin famously argued that Tolstoy was a writer in search of Big Truths, but his ability to see reality in all its particulars destroyed the very theories he hoped to build. By entering directly into life in all its contradictions, he destroyed his own peace of mind. But after “Anna Karenina,” that changed. He was overwhelmed by the pointlessness of existence. As his biographer A.N. Wilson surmises, he ran out of things to write about. He had consumed the material of his life. So he gave up big novels and became a holy man. Fulfilling his early ambition, he created his own religion, which rejected the Jesus story but embraced the teachings of Jesus. He embraced simplicity, poverty, vegetarianism, abstinence, poverty and pacifism. He dressed like a peasant. He wrote religious tracts to attract people to the simple, pure life. Many contemporary readers like the novel-writing Tolstoy but regard the holy man as a semi-crackpot. But he was still Tolstoy, and his later writings were still brilliant. Moreover, he inspired a worldwide movement, deeply influencing Gandhi among many others. He emerged as the Russian government’s most potent critic — the one the czar didn’t dare imprison. There were many consistencies running through Tolstoy’s life, but there were also two phases: first, the novelist; then, the crusader. 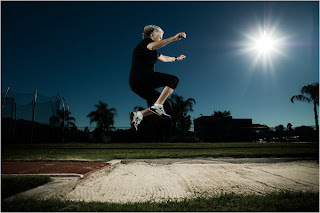 And each of these activities called forth its own way of seeing...."
Olga Kotelko, a 91 year old Canadian, is one of the world's greatest athletes. 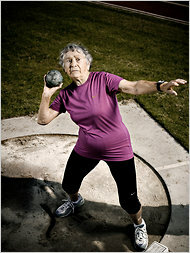 She holds 23 world records, including 17 in her current age category, 90 to 95. I'd like to age like her. Who wouldn't? Read more in this fascinating New York Times article. "Scott Sandage, an associate professor of history at Carnegie Mellon University and author of Born Losers: A History of Failure in America explains that America's relationship with failure has evolved over time, noting that the word initially applied only to matters of business, not character. Up until the Civil War, he argues, people who suffered economic misfortune were described as making a failure, not being a failure. Sandage asks: "Why have we as a culture embraced modes of identity where we measure our souls using business models?" Brett Arends makes a strong point that California's budget shortfalls are actually a result of California's subsidizing the rest of the U.S. over the years. "In the quarter century through 2005 (the most recent year for which we have data), Californians bailed out the rest of America to the tune of about $620 billion in today's dollars. In 2005 alone it came to nearly $50 billion. That is 30 times next year's forecast "budget shortfall" in Sacramento. The only reason California has a budget problem at all is because they have, foolishly, spent so much money subsidizing everyone else. If it weren't for that, California could cut its state and local taxes by around $1,300 a person. That's a $1,300 tax cut for every man, woman and child. Hmmm. Funny you never read about that anywhere, isn't it? Meanwhile, take with giant fistfuls of salt those self-serving claims of fiscal rectitude you're apt to hear from politicians in other states, especially in the South and the West. These states haven't balanced their own budgets with their own money in living memory. Without bailout money from states like California, New York and New Jersey, their taxes would be much higher and their citizens poorer. But don't expect to hear any of this from California bashers — least of all those on the right. After this November's electoral humiliations of Meg Whitman and Carly Fiorina, the Republican Party is putting away the kid gloves and getting out the knife. State debt costs come to just $6 billion a year — a fraction of the $90 billion-plus budget. Under the state Constitution, the interest on the debt gets paid second, after the $36 billion that goes to K-12 education...."
Roger is the authority on emotional eating. He's wise and thoughtful and truly cares about helping people. Please read his new article on Thanksgiving and Christmas in The Huffington Post. "It's the most wonderful time of the year..." How many of us hear that song and couldn't disagree more? The holiday season for some is a joyful, happy time, particularly if you've come from a perfect nuclear family. And since that includes about .0003% of the population, the majority of people have mixed feelings at best about the time between Thanksgiving and New Year's. There are plenty of reasons to be stressed out; there are cookies to bake, there is weight that you want to avoid gaining but will probably gain, there are presents to buy which rouses feelings of financial adequacy or inadequacy, and then there is the family get together. Essentially, the things you have and the things you lack are exaggerated. The annual holiday get together provides the ideal conditions for flare-ups. The expectations we have of the holidays are almost always unrealistic, making disappointments inevitable. We often stay attached to the past, unwilling to accept that the hand of time has actually changed the people and the landscape of our lives. The holidays can be painfully the same every year because we do not allow the members of our families to be who they currently are; rather, we expect them to be who they've been." In fact, unless you're a drug kingpin or a Wall Street trader, my guess is that the other factors are at work every time you think about your work. Useful for individuals as well. Recently, President Obama was asked by a foreigner about America's exceptionalism. President Obama's response has been cut short and often criticized. It's worth reading President Obama's whole response to the question. It's eloquent, humble, strong, and very well thought out. This whole debate acts as a great exercise in seeing how opponents remove words from their context and then use those words to justify their own ends. It's quite disingenuous really, and suggests the need for all readers to be on their guard to what is left out of news reports and arguments for and against. The spaces between the notes often say more than the notes themselves. I believe in American exceptionalism, just as I suspect that the Brits believe in British exceptionalism and the Greeks believe in Greek exceptionalism. I'm enormously proud of my country and its role and history in the world. If you think about the site of this summit and what it means, I don't think America should be embarrassed to see evidence of the sacrifices of our troops, the enormous amount of resources that were put into Europe postwar, and our leadership in crafting an Alliance that ultimately led to the unification of Europe. We should take great pride in that. A strong point by Andrew Sullivan on a Big Lie in American politics today. His thought experiment (below in bold) is particularly worth reflecting on. "It seems to me that the last year or so in America's political culture has represented the triumph of untruth. And the untruth was propagated by a deliberate, simple and systemic campaign to kill Obama's presidency in its crib. Emergency measures in a near-unprecedented economic collapse - the bank bailout, the auto-bailout, the stimulus - were described by the right as ideological moves of choice, when they were, in fact, pragmatic moves of necessity. The increasingly effective isolation of Iran's regime - and destruction of its legitimacy from within - was portrayed as a function of Obama's weakness, rather than his strength. The health insurance reform - almost identical to Romney's, to the right of the Clintons in 1993, costed to reduce the deficit, without a public option, and with millions more customers for the insurance and drug companies - was turned into a socialist government take-over. Every one of these moves could be criticized in many ways. What cannot be done honestly, in my view, is to create a narrative from all of them to describe Obama as an anti-American hyper-leftist, spending the US into oblivion. But since this seems to be the only shred of thinking left on the right (exacerbated by the justified flight of the educated classes from a party that is now openly contemptuous of learning), it became a familiar refrain - pummeled into our heads day and night by talk radio and Fox. If you think I'm exaggerating, try the following thought experiment. This is the era of the Big Lie, in other words, and it translates into a lot of little lies - "death panels," "out-of-control" spending, "apologies for America" etc. - designed to concoct a false narrative so simple and so familiar it actually succeeded in getting into people's minds in the midst of a brutal recession. And integral to this process have been conservative "intellectuals" who should and do know better, but have long since sacrificed intellectual honesty for the cheap thrills of enabling power-grabs. And few lies represent this intellectual cooptation of talk radio/FNC propaganda better than the lie that Obama has publicly rebutted the idea of American exceptionalism." A wonderful interview in The Paris Review with John McPhee. "The thing about writers is that, with very few exceptions, they grow slowly—very slowly. A John Updike comes along, he’s an anomaly. That’s no model, that’s a phenomenon. I sent stuff to The New Yorker when I was in college and then for ten years thereafter before they accepted something. I used to paper my wall with their rejection slips. And they were not making a mistake. Writers develop slowly. That’s what I want to say to you: don’t look at my career through the wrong end of a telescope. This is terribly important to me as a teacher of writers, of kids who want to write." "Certainly the aural part of writing is a big, big thing to me. I can’t stand a sentence until it sounds right, and I’ll go over it again and again. Once the sentence rolls along in a certain way, that’s sentence A. 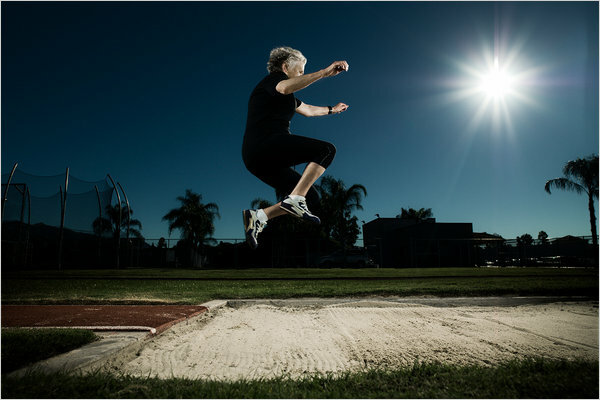 Sentence B may work out well, but then its effect on sentence A may spoil the rhythm of the two together. One of the long-term things about knitting a piece of writing together is making all this stuff fit." A 15-month-old girl survived a fall from a seventh-floor apartment in Paris almost unscathed after bouncing off a cafe awning and into the arms of a passerby, police said today. The baby had been playing unsupervised with her four-year-old sister yesterday when she fell out of the window, a police spokesman said. A young man saw the baby starting to fall and alerted his father, who raced into position, arms outstretched, to catch her after she hit the awning, the daily Le Parisien reported. "He must have played rugby for years to have developed reflexes like that," a bystander who saw the incident told the paper. Police said the girl appeared to have no serious injuries and was under observation in a nearby hospital. The owner of the cafe, located at the foot of the block of flats in north-east Paris, said it was a stroke of luck he had decided to leave the awning open that afternoon. "I usually close it to stop it catching fire as people tend to throw their cigarette butts on to it."